Let the morning time drop all it's petals on me. I absolutley LOVE this shot and together with the lyrics - it's pure magic! 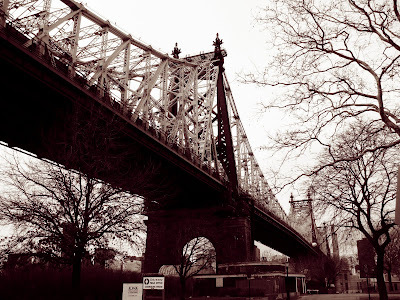 I still know it now as when I was little as the Queensboro Bridge. The iron latticework of iron is massive yet somewhat delicate as it towers over the East River. This is a beautiful photo. I also liked the lyrics. It ties in beautifully together. I love that song and it's wonderful to actually see the bridge. Nice photo of the bridge, Mary. so nice photo of the bridge..
Haha, groovy is so 70s yet the words still make you groove! And the image of the bridge is as timeless as the music!